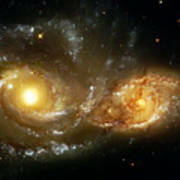 The larger and more massive galaxy is cataloged as NGC 2207 (on the left in the Hubble Heritage image), and the smaller one on the right is IC 2163. Strong tidal forces from NGC 2207 have distorted the shape of IC 2163, flinging out stars and gas into long streamers stretching out a hundred thousand light-years toward the right-hand edge of the image. e to distort and disrupt each other. 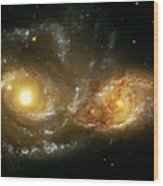 Eventually, billions of years from now, they will merge into a single, more massive galaxy. 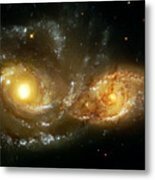 It is believed that many present-day galaxies, including the Milky Way, were assembled from a similar process of coalescence of smaller galaxies occurring over billions of years. 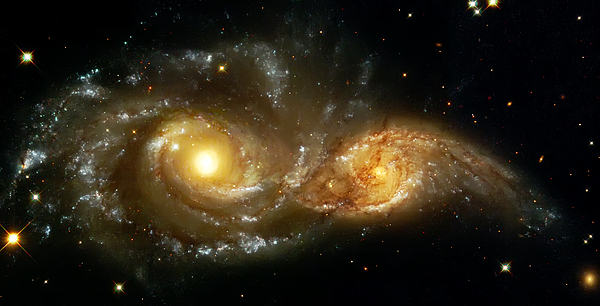 Photographs of spiral galaxies from deep space make great gift ideas for astronomy buffs! Fine art photography by Milwaukee area freelance photographer Jennifer Rondinelli Reilly. Selling original fine art photos featuring travel,landscapes,music photography and more. Specializing in Wisconsin landscape photography. I also offer high resolution Space Art and create many original derivative works of art for you to enjoy in your home or office. Purchase just a print or have it custom matted and framed. All vintage and Space images have been restored,retouched, and given a fine art treatment to bring you MAXIMUM image quality. New images are added daily so check back often for the latest uploaded art. All images are Copyright Jennifer Rondinelli Reilly. All Rights Reserved. No use without permission.